Trump is now warning Sen. John McCain, failed presidential candidate, to “be careful” with his actions and words because Trump will “fight back” at some point. Oh, for the love of — look, Trump was insulted all during the election because he only used simple, childish words, but listening to McCain reminds us all that using nothing but fancy words when you really mean to say something simple makes you sound like a self-righteous blowhard. Would it have been that difficult to say that you thought Americans were turning towards “fake nationalism invented by liars who want to blame their problems on someone else?” Or would that make you sound too Trump-like? McCain’s whole speech was a long complaint about Trump. And Trump, in his refreshing fashion, told the Chris Plante show that yes, he had heard McCain’s criticisms and his only answer to McCain was to be careful. McCain said in response that he has “faced far greater challenges than this.” Nobody is denying your history, Senator, we’re just asking you to remember that this is about American interests, not a personal feud you have with a big blustery New Yorker. 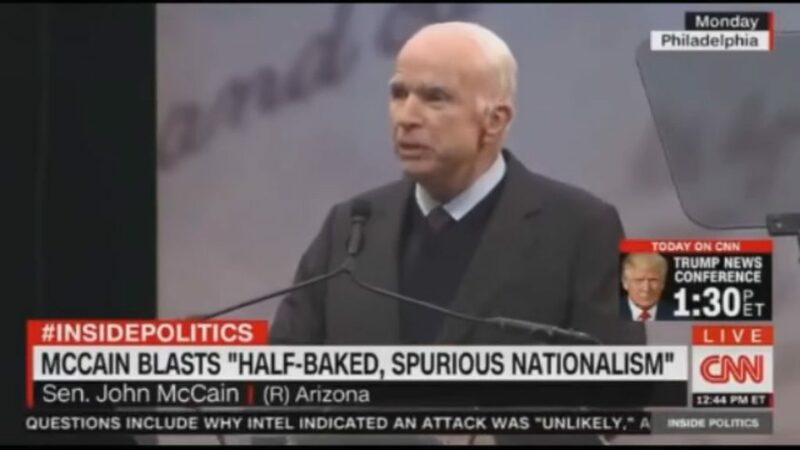 A few weeks ago, McCain told us that while Trump is all about making money, he’s about “duty, honor and country.” He suggested that since The Donald was “in the business of making money” with success on television and with Miss America, he’s not at the same high level of worthiness as McCain, who said that because he was “raised in a military family” that his beliefs and focus were the best way to behave. Thanks John. Remember that time you lost the election? It had nothing to do with the pompous idea that everyone in business has no honor, did it? Just before saying that, he was identified as the vote responsible for not passing the Graham-Cassidy bill that would repeal ObamaCare.